The design approach for this home’s exterior was to treat each functional area as its own space, similarly to how one would layout interior spaces. Spaces were designated for dining, cooking, relaxing, swimming, entertaining, and gardening, and their functional requirements and connection to the home’s interior were established. This information was used to organize purposeful outdoor living spaces that would complement the homes interior layout and be flexible enough to host a number of different activities. With this methodology the design team arrived at a plan consisting of a wide deck across the back of the home’s living level. From the deck one could access the screen porch below by a spiral staircase within a screened lantern-like gazebo. 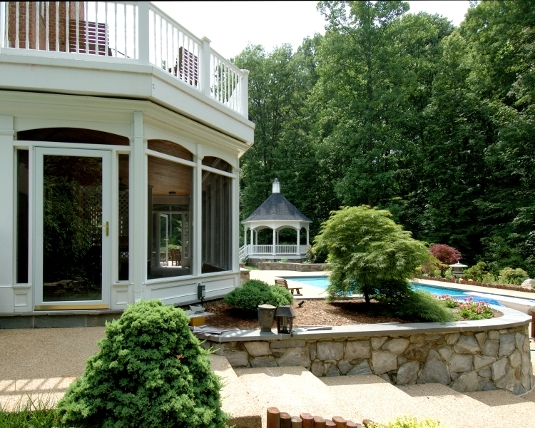 At the lower level, the screen porch contains an exterior kitchen and opens onto the pool patio. 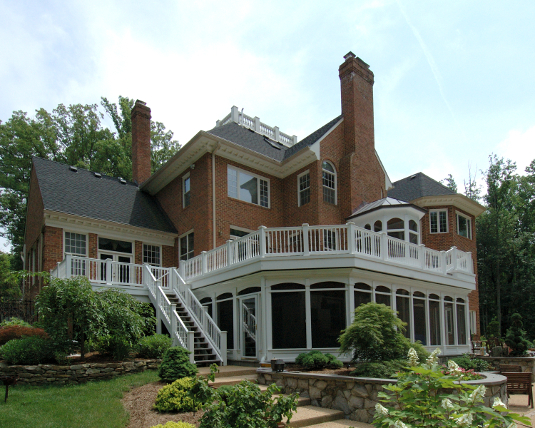 The screen porch stays dry through the use of a sluice system that directs water off of the deck. Water flows through the system to a perimeter gutter designed to look like trim. This allowed the underside of the deck to be finished with an attractive painted bead board. 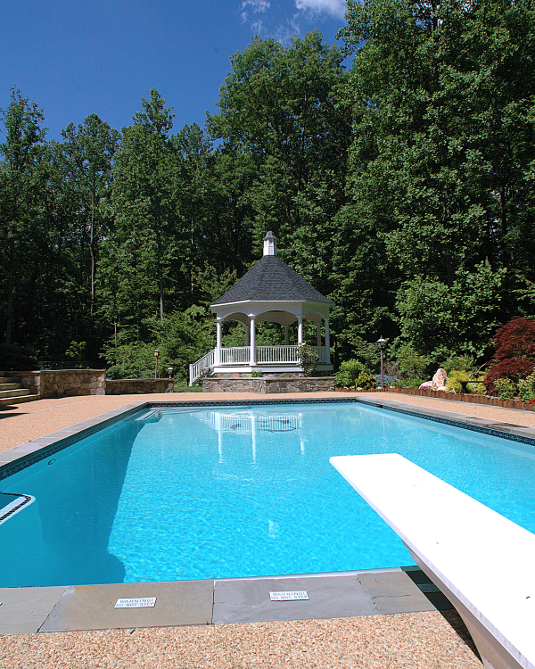 Opposite the pool sits a gazebo which not only provides a casual dining space, but also conceals the pool equipment beneath its surface. 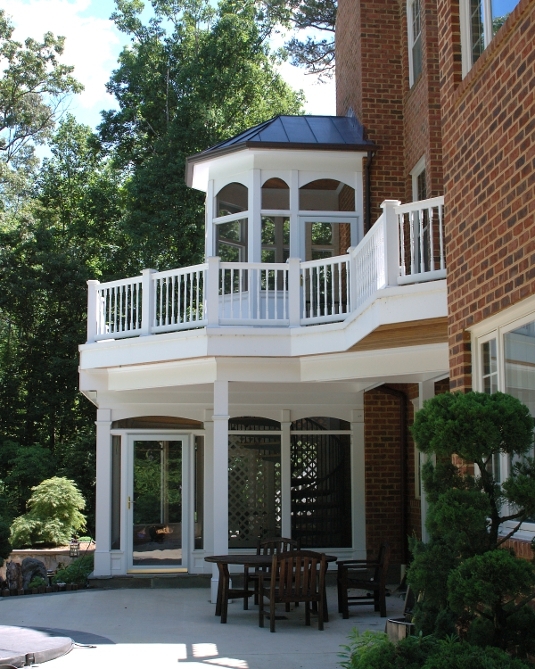 All materials used in the deck and gazebo were selected for their low-maintenance qualities. Between each of these functional areas landscaping elements and walkways are located to lend individuality and interest to each space. Carefully selected plantings complete the design and serve to define spatial boundaries and add privacy.